Who said rice cakes were boring !!!! On their own they are, but as part of a deliciously tasty lunch they make a superb base for lightly mashed avocado topped with full-of-flavour baby tomatoes and drizzled with just a touch of olive oil and a squeeze of lemon juice and they suddenly burst into life. Add to this a few pecans (or walnuts if you prefer), a little turkey breast and a roll or two of your favourite cheese and you have a lunch fit for a king – or a princess (I watched my little grand-daughter hungrily spreading her rice cakes with avocado over the bank holiday weekend). Not forgetting my (not very good) attempt at a radish rose. My very favourite lunch whilst sitting outside on a beautifully warm Spring day. Simple, tasty and so very good. 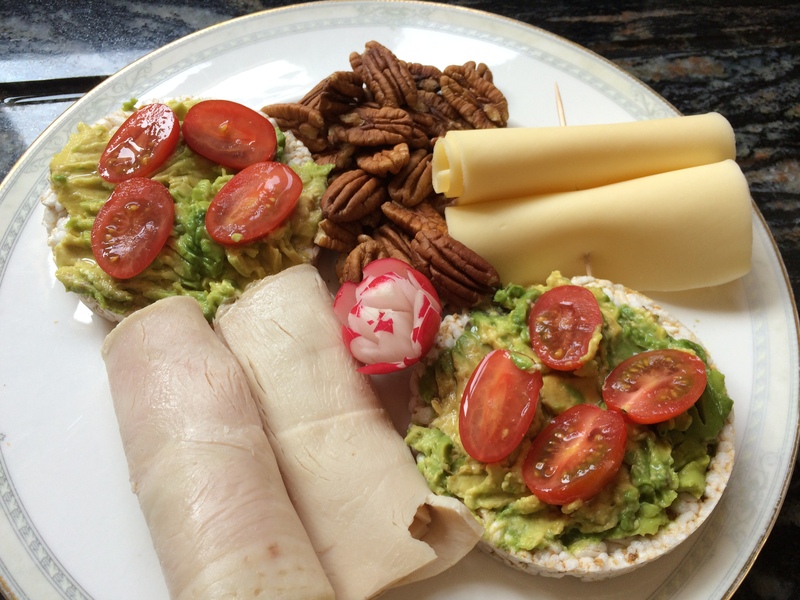 This entry was posted in Brunch, Lunch, Miscellany and tagged Avocado, Gluten Free, Healthy Eating, Lunch, Pecans, Radish, Rice Cakes, Tomatoes, Wheat-Free. Bookmark the permalink.